The Supreme Court building in Washington at sunset, Oct. 10, 2017. Civil rights groups are expressing outrage over a recent Supreme Court ruling that could make it harder for Native Americans in North Dakota to cast their votes in the upcoming midterm elections. Last week, the Supreme Court ruled against overturning North Dakota's controversial voter ID law which requires voters to present identification that verifies a current residential street address. 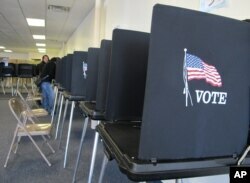 Proponents of the law say it will help prevent voter fraud. Opponents say it will prevent many Native Americans from voting. "Addressing on reservations and in rural Native American communities is spotty," Jacqueline D. De Leon, a member of the Isleta Pueblo in New Mexico and an attorney for the Native American Rights Fund (NARF), told VOA in August. "Many homes lack street addresses, and their owners must depend on post office boxes to send and receive mail. In addition, poverty and housing shortages have left many homeless or moving from house to house couch surfing, so they aren't able to produce addresses." In April, a federal district court in North Dakota ordered the state to allow voters to cast ballots, provided they had ID cards with a current street address. The court ruled that P.O. Box numbers were permissible, and Native Americans were able to participate in primary elections held in June. But last month, the U.S. Court of Appeals put that order on hold and took the issue to the Supreme Court, which ruled against the federal district court on Oct. 9. "The law clearly discriminates against Native Americans in North Dakota," said Mike Faith, chairman of the Standing Rock Sioux Tribe, in a written statement. "Our voices should be heard fairly at the polls, just like other Americans." Faith's reservation straddles North and South Dakota. Some analysts suggest the ruling is an attempt by Republicans to block U.S. Senator Heidi Heidkamp, a member of the North Dakota Democratic–Nonpartisan League Party, from winning a second term in the November vote. In 2012, she won by a narrow margin which analysts then attributed to strong Native American support. "The irony here is that I think it [the Supreme Court ruling] was the best thing that could have happened to Heidi Heidkamp," said Mark Trahant, a member of the Shoshone-Bannock Tribe in Idaho and editor of Indian Country Today. "The Native vote has not necessarily turned out for her this time, but with tribes working overtime to help members obtain valid addresses and ID, she actually could get a turnout of Native voters she wouldn't have gotten any other way." "It is the height of irony that Native Americans, the original inhabitants of this land, are being forced to prove their residency to be able to participate in American democracy," she said. "It is undemocratic that they must do so with a qualification of a residential street address that they do not have through no fault of their own." De Leon vowed that NARF will continue to resist what she called "assaults" on Native Americans' fundamental rights.